And Sharon Pincott’s years of work with them, is currently freely available for online viewing on https://vimeo.com/231846100. This one-hour All the President’s Elephants documentary was filmed with Pincott in Hwange in 2011, by the South African production company Triosphere. It is the story of Pincott’s life, work and intimate relationship with the Presidential Elephants of Zimbabwe, showcasing these Hwange elephants and some of the problems they face. It includes her wire snare removal work with colleagues called in to dart well-known injured elephants using a Tranquiliser gun. It also features Pincott’s work recommending and encouraging President Robert Mugabe to reaffirm his commitment to this flagship clan of elephants, which bears his identity, in an effort to secure their future. The subsequent ‘Presidential Decree Reaffirmation’ ceremony, attended by then-Minister of the Environment Francis Nhema on behalf of President Robert Mugabe, was held in Hwange in August 2011 and was included in the filming. All the President’s Elephants premiered at the 2012 Durban International Film Festival, where it was considered among the best on show. 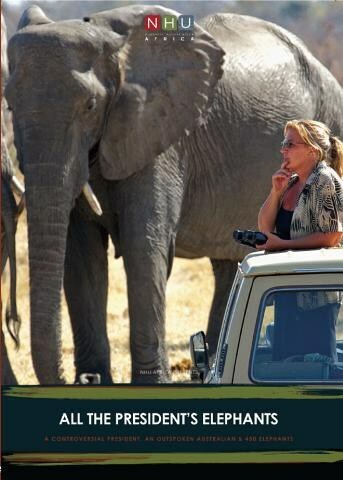 During an interview with Pincott in 2013 ScreenAfrica – Africa’s leading broadcast and film publication – called the film “touching and profound…beautifully emphasis[ing] the deep relationship between Pincott and the elephants”. This documentary focusing on Pincott’s wild elephant work and relationships won ‘Outstanding Contribution to Nature’ in 2013, with the judges commenting how “very moving” it was “to see how closely people and elephants can be mentally connected”, and expressing their respect and appreciation for Pincott’s elephant conservation work. Among other nominations and selections including ‘Best TV Wildlife Program’ at the South African Film and Television Awards 2013, it was shortlisted as a finalist in the prestigious 2016 International Elephant Film Festival – where the world’s best elephant films from the previous nine years were celebrated. This event, which involved both the United Nations (UN) and the Convention on International Trade in Endangered Species (CITES), was organised to raise global awareness of the various challenges facing the African and Asian elephants, as a highlight of UN World Wildlife Day 2016. The distinguished panel of international judges included the United States Under Secretary of State for Economic Growth, Energy, and the Environment, South Africa’s Minister of Environmental Affairs and the Director-General of the International Union for Conservation of Nature (IUCN). When All the President’s Elephants screened on France 5 television, its name was changed to La Gardienne des Éléphants – The Elephant Guardian – matching the name Pincott was frequently called in Zimbabwe. She was also well-known as Mandlovu, meaning Mother Elephant in the Zimbabwean Ndebele language. All the President’s Elephants facebook page can be found at www.facebook.com/PresidentialElephantsDocumentary.